The story of Varaha Narasimha Swamy is associated with the intense and unwavering devotion of Prahlad. Varaha and Narasimha are two incarnation of Srihari Vishnu. But in temples in Andhra Pradesh there are murtis with both the images of Varaha (Boar) and Narasimha (half man half lion). Vishnu had shown both the avatars in a single form to Prahlad. Hiranyaksha who had seized the earth and carried it into another region was killed by the Varaha incarnation of Vishnu. Hiranyakashipu, brother of Hiranyaksha, wanted to take revenge on Vishnu. He banned all forms of worship dedicated to Vishnu. But his son Prahlad was an ardent devotee of Vishnu. Hiranyakasipu tried all means to change the ways of Prahlad but he failed. Finally he decided to annihilate Prahlad. He tried numerous means to kill Prahlad but each time Vishnu came to the rescue of the young boy. Hiranyakasipu once ordered soldiers to throw Prahlad into sea and place a mountain on the spot so that he can never escape. As ordered, the soldiers took Prahlad to the present day Simhachalam and threw the boy into sea thinking they will place the Mountain Simhachalam on top of him. But Vishnu appeared on the scene and rescued the young Prahlad. Prahlad then requested Vishnu to show him the form of Varaha and Narasimha. The one by which the Lord had already killed Hiranyaksha and the other by which He will kill Hiranyakashipu in future. 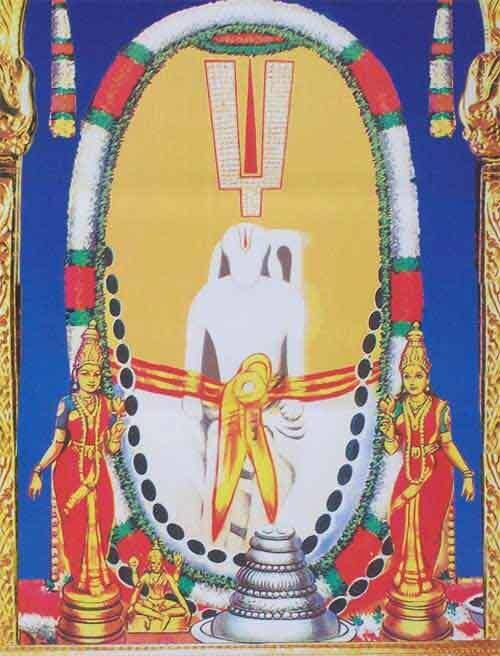 Vishnu thus showed the form of Varaha Narasimha to Prahlada at Simhachalam. The famous Varaha Narasimha Swamy Temple is located at Simhachalam in Andhra Pradesh.